The brother of the singer formerly known as Cat Stevens strongly denied that he has any terrorist associations after he was removed from a London-to-Washington flight because he'd been placed on a government "no-fly" list. A government official said on Wednesday that Stevens, who changed his name to Yusuf Islam, had recently been placed on the list after U.S. authorities received information indicating associations with potential terrorists, a government official said Wednesday. The flight was diverted to Bangor, Maine, on Tuesday afternoon after U.S. officials who checked the passenger list learned the singer was aboard. Federal agents met United Airlines Flight 919 and interviewed Islam. The government official, who spoke only on condition of anonymity, said Islam was placed on a watch list after multiple intelligence sources in recent weeks indicated the peace activist may have associations with potential terrorists. Islam's brother and business manager, David Gordon, said in a telephone interview that he could guarantee that Islam does not associate with possible terrorists. "It's not true," Gordon said. "His only work, his only mindset, is humanitarian causes. He just wants to be an ambassador for peace." Gordon said he spoke by phone to Islam on Wednesday night and that he was in good humor. "He's fine. It's an unfortunate incident, but on the other hand, people are worried and they want to feel secure when they're flying." Airlines have access to watch lists and are supposed to screen passengers to make sure those deemed direct threats to aviation do not board planes. The official said it was unclear why United Airlines personnel allowed Islam to get on the flight in London. A call to the airline was not immediately returned. Homeland Security Department spokesman Dennis Murphy said Islam was "denied admission to the United States on national security grounds" and was expected to be sent back to London on Wednesday. 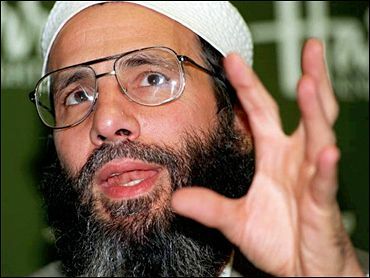 A second government official, who also spoke on condition of anonymity, said U.S. authorities think donations from Islam may have ended up helping to fund blind sheik Omar Abdel-Rahman, who was convicted for the 1993 World Trade Center bombing, and Hamas, a Palestinian militant group considered a terrorist organization by the United States and Israel. In July 2000, Islam was deported hours after arriving in Jerusalem. A local paper reported then that the government claimed he had delivered tens of thousands of dollars to Hamas during a visit in 1988. Islam denied ever knowingly supporting Islamic terrorists. Islam has made a number of trips to the United States in recent years, including one in May for a charity event and to promote a DVD of his 1976 MajiKat tour. He donated half the royalties from his most recent boxed set to the Sept. 11 Fund to help victims of the attacks. Islam, who was born Stephen Georgiou, took Cat Stevens as a stage name and had a string of hits in the 1960s and '70s, including "Wild World" and "Morning Has Broken." Last year he released two songs, including a re-recording of his '70s hit "Peace Train," to express his opposition to the U.S.-led war in Iraq. He abandoned his music career in the late 1970s and changed his name after being persuaded by orthodox Muslim teachers that his lifestyle was forbidden by Islamic law. He later became a teacher and an advocate for his religion, founding a Muslim school in London in 1983. Islam founded Islamia Primary school in London in 1983. In 1998, it became the first Muslim school in Britain to receive government support, on the same basis as Christian and other sectarian schools. Islam drew some negative attention in the late 1980s when he supported the Ayatollah Khomeini's death sentence against Salman Rushdie, author of "The Satanic Verses." Gordon denied that he had called for Rushdie's death. "They completely misunderstood what he said," he said. Recently, Islam has criticized terrorist acts, including the Sept. 11 attacks and the school seizure in Beslan, Russia, earlier this month that left more than 300 dead, nearly half of them children. In a statement on his Web site, he wrote, "Crimes against innocent bystanders taken hostage in any circumstance have no foundation whatsoever in the life of Islam and the model example of Prophet Muhammad, peace be upon him."